Call 201-283-8123 to schedule your first appointment. Although hearing loss is a common ailment in America, it can still be difficult to handle on your own. That’s why Miracle-Ear® is committed to serving as many people as possible with comprehensive hearing solutions in a comfortable and welcoming environment. When you work with us, you’ll be met with hearing care specialists who are dedicated to assisting you with reaching your best level of hearing. We’ll be happy to provide you with a free hearing test* in Hackensack that will help us determine your individual hearing needs. Our hearing solutions are not only created by utilizing cutting-edge technology and modern equipment, but they’re also designed to enable you to move freely between locations without having to deal with unwanted resonances. Our new GENIUS™ Technology is a great choice for those who want the freedom to live their life to the fullest without restrictions on where they can and cannot go. We can even equip your hearing aid with Bluetooth® technology so that you can watch TV and talk on the phone with the utmost comfort and ease. Don’t take the risk of putting your hearing in the hands of just any hearing aid center. Turn to Miracle-Ear for high-quality hearing aids in Teaneck, NJ. Call or visit us today for more information about why we’re America's most recognized brand of hearing aids. 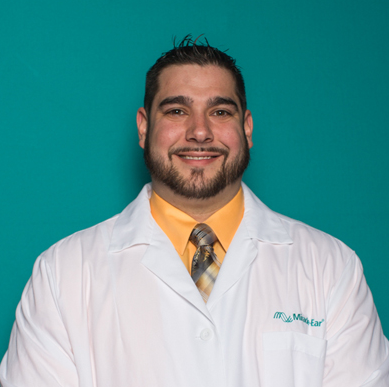 John has 4 years of experience as a Hearing Instrument Specialist. John also received the Miracle-Ear Rookie of the Year award in 2015. John's favorite part about working at Miracle-Ear is being able to give back the quality of life that people seem to miss out on with hearing loss.